Create a unique (and easy!) 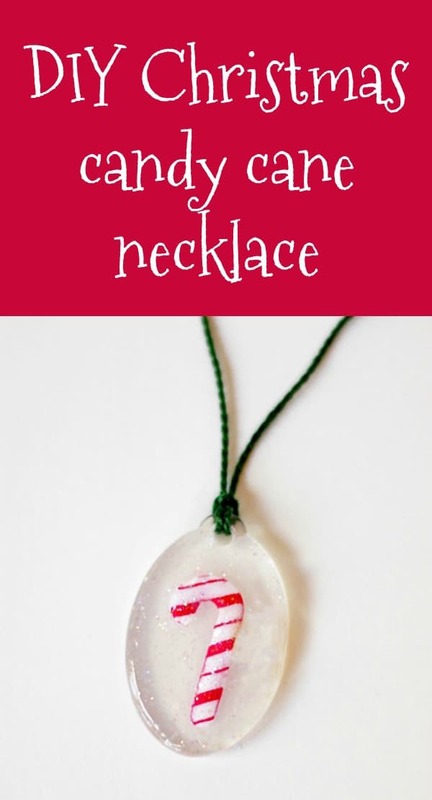 Christmas necklace with a candy cane design in a few easy steps! You'll love making this and adding it to your holiday wardrobe. I'm Heidi from the blog Hands Occupied, and I'm very excited to be sharing a DIY Christmas candy cane necklace with you all! 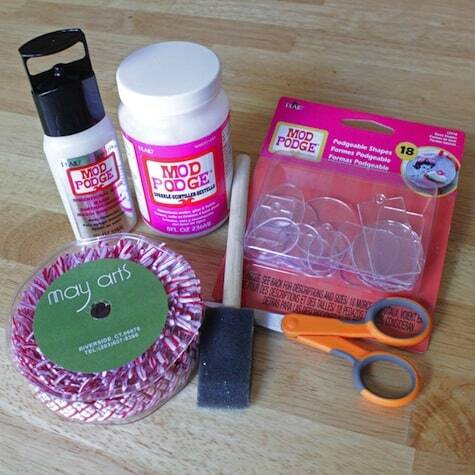 For today's project, I decided to create a tutorial with some Mod Podge products you don't necessarily see every day around the crafty blogosphere. I wanted my project to be something festive now that the holiday season is upon us – but I also wanted it to be a project that wouldn't take 20 hours to make since we're all crazy busy in December. Begin by prepping your candy cane accent. I used some awesome satin cutout ribbon from the May Arts Company that I had on hand. 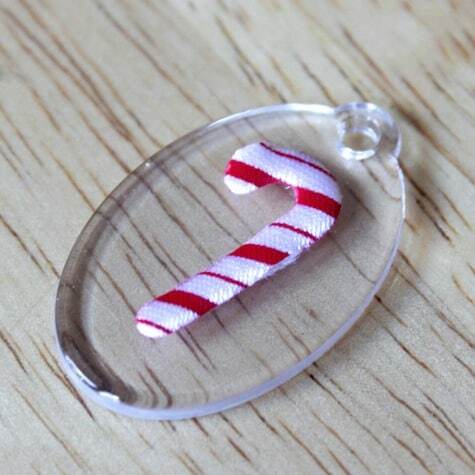 You can also make your own candy cane with striped paper. Clean your Podgeable shape if necessary. 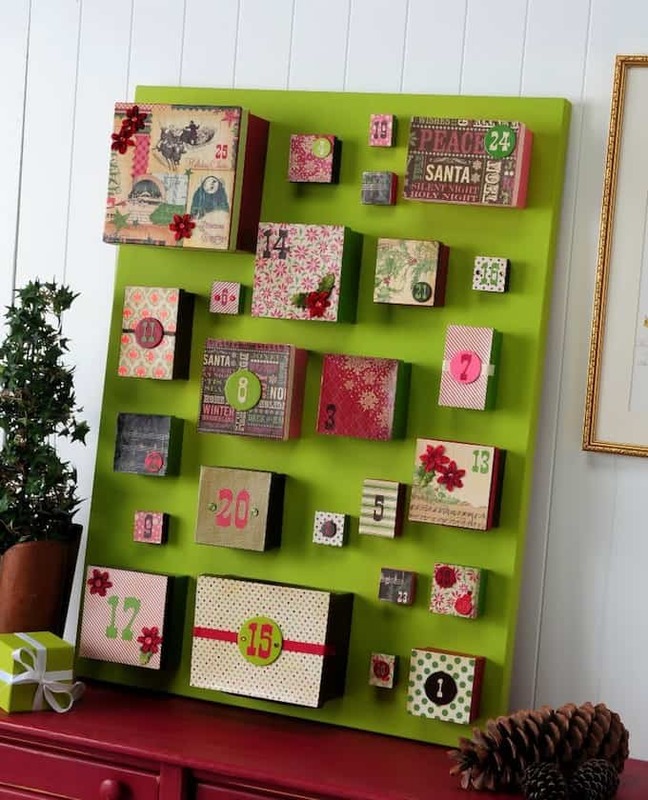 Using a sponge brush, paint a layer of sparkle Mod Podge onto the top of the shape and place your candy cane as desired. 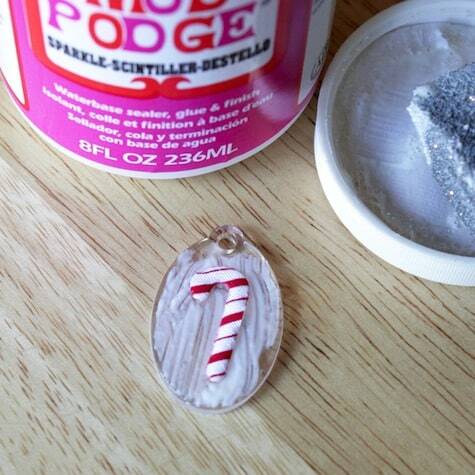 Paint another layer of Mod Podge Sparkle over your candy cane, being careful not to move it around. 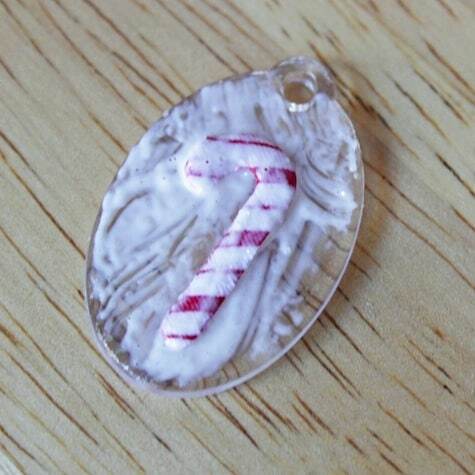 I saturated my candy cane shape, which was puffy, so mine took more Mod Podge than if you're using a paper shape. Let dry. When your candy cane necklace is dry, grab your silver Glitter Dimensional Magic. Much of the glitter in my new bottle of the formula had settled to the bottom. I gently turned the bottle upside down and right side up a few times to even out the glitter throughout the bottle. Don't shake it! Bubbles are your enemy when working with DM, and shaking creates them. Open your Glitter Dimensional Magic. 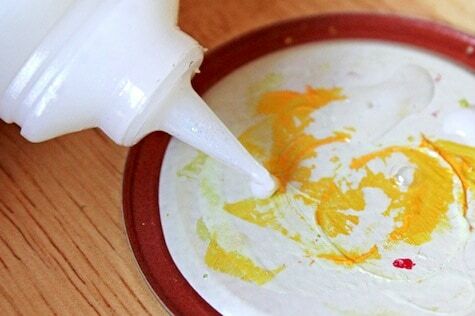 Get the flow of the formula going by squeezing a few drops onto a scrap of paper or jar lid (you can see I use old mason jar lids for crafts a lot by the picture). 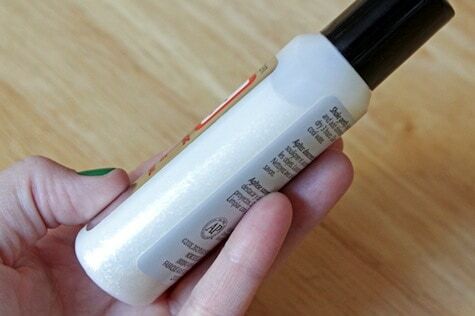 This helps get rid of the bubbles at the top of your bottle too. 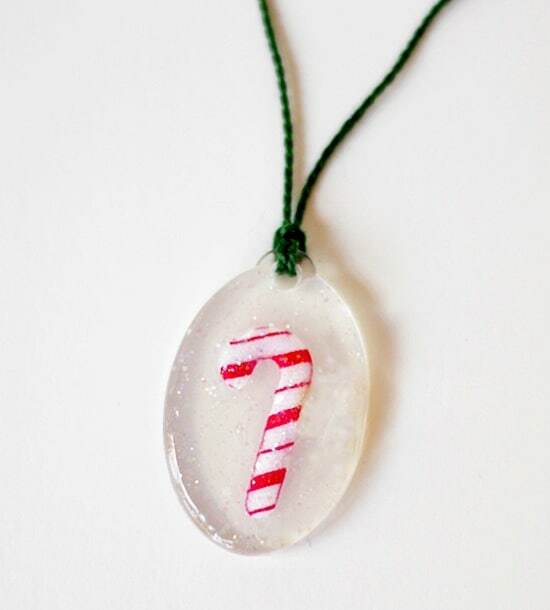 Carefully apply Dimensional Magic around and over your candy cane necklace, filling the Podgeable shape right up to the edges. The first time I ever used Dimensional Magic, I just squirted a ton of the formula in the center of a Podgeable shape and it ended up overflowing and screwed up my whole project. Even if you're taking lots of care to avoid bubbles in your Dimensional Magic, they still can happen, as you can see in the picture on the left above. There are a few ways to deal with bubbles: a sharp pin can pop the bubbles when the formula is still wet, a fine brush can be used to “scoop” the bubbles out if you have a steady hand, and a lighter can be used to get rid of bubbles when the Dimensional Magic has dried. 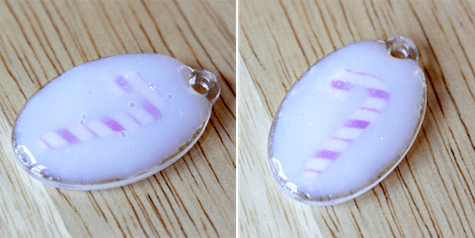 Let your Christmas necklace charm dry for 24 hours. I always make a sign to place next to any Dimensional Magic projects as they dry to keep my husband from accidentally setting something on them. I don't know what all of you crafters with kids do to keep your work safe! Lock and key? Feel free to leave tips on this in the comments. After 24 hours, your DIY Christmas necklace will be dry and clear. If any pesky bubbles show up over night, remember the lighter trick to get rid of them! String the charm on a piece of embroidery floss, and you've got a cute holiday necklace, gift accent or key charm. Like this project? Follow Hands Occupied on Facebook, Twitter and Pinterest for more tutorials and inspiration. This is cute! I have a bottle of dimensional magic, but have not used it due to the drying times. It’s not the kids, it’s the CATS. And trying to protect things (with say, a box) only creates more feline interest. I am sure I have cat fur in the coasters I modpodged last night–and maybe footprints, but it won’t be visible. I think. I’ve got a huge, heavy bell jar I stick on top of things. Sometimes it’ll get humid, so I just wedge a thin book underneath to let the air flow. A cat would really have to try to get past it! Love this! Very magical idea! TFS! I think a photo would be fine! That’s so sweet! I need to get into Dimensional Magic! I can’t wait to try this. this is so cute. I’ll be on the hunt for those podgeable shapes! This is too cute! All KINDS OF SHAPES!!! Woo Hoo! Happy Dance! the dollor stores have cake savers they are cheep and I do not trust them to carry cakes but they are good for keeping drying crafts safe.. Ya know the ones with the cake server plate and the tall cover! 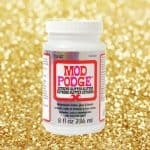 How would Mod Podge work using Shrinky Dink shapes? Would the two be compatible? Would this work with some thing more delicate like dried flowers?